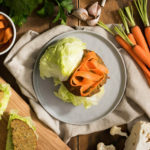 Loaded with cauliflower, broccoli and fresh herbs, this chickpea veggie burger is served in a fun lettuce bun and topped with quick pickled carrots. It’s a tasty and healthy burger you’ll want to serve all summer long. Pickled Carrots: Using vegetable peeler, slice carrots lengthwise into thin ribbons. Toss together carrots, vinegar, dill, garlic, salt and sugar. Let stand for at least 20 minutes at room temperature or refrigerate for up to 8 hours. Veggie Burger: In large pot of boiling salted water, cook cauliflower florets for 2 minutes. Add broccoli florets; cook for 2 to 4 minutes or until just tender. Drain well and let cool to room temperature. In food processor, mix together chickpeas, lemon juice and garlic until finely ground. Add cooked cauliflower, broccoli, green onions, parsley, cilantro, sesame seeds, thyme, cumin, chili powder, salt, pepper and smoked paprika; pulse until coarsely ground. Add egg and gluten-free bread crumbs; pulse until combined. Divide into 6 portions. Shape into 1/2-inch (1 cm) thick patties. Heat 2 tbsp (30 mL) oil in large skillet set over medium heat; in 3 batches, cook patties for 3 to 5 minutes per side or until golden brown, adding remaining oil as needed. Slice off 4 large cheeks from each head of iceberg lettuce; cut each into 1-inch (2.5 cm) thick lettuce “bun half” (reserve remaining lettuce for another use). Sandwich each burger between 2 lettuce bun halves with Pickled Carrots. Drizzle the burger with tahini sauce or sriracha mayonnaise for extra richness. Alternatively, serve the burger as a wrap in large Boston lettuce leaves.